There are four bedrooms on the top floor. The Marmotte bedroom can have either a 6 foot double or twin beds. Its en-suite bathroom has a bath with an over-bath shower. French windows open onto a balcony, leading onto a small bridge to the terrace and hot tub, and views to the meadows above. The Valley bedroom can also have either a 6 foot double or twin beds. There are two additional single beds. It has an en-suite bathroom with a claw footed bath and hand shower. French windows lead out onto a balcony, with a stunning panoramic view. The Four Poster bedroom has a double bed. It has an en-suite bathroom with a claw footed bath and hand shower. French windows lead out onto a balcony, with a stunning panoramic view. 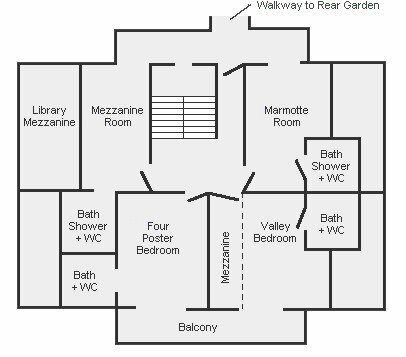 The Mezzanine bedroom has a 5 foot double bed, and an en-suite bathroom with bath and an over-bath shower. French windows open onto a balcony, leading onto a small bridge to the terrace and hot tub, and views to the meadows above.